Not that I think you are dense or anything, but I am just going to say it right off the bat: you need to turn on your oven to make this. If that turns you away, so be it, but all I can do is offer my promise that turning on your oven to make this is so worth it. Any other time of the year, I wouldn't need to give this disclaimer, but I feel like everyone is sweltering lately. Even living here in San Diego where we supposedly have a 'mild' climate, it is HOT. (I finally broke down and bought my first fan! Please don't make fun of me that I didn't have a fan before.) You probably think I am crazy, telling you to make a Roasted Eggplant and Red Pepper Dip when your house is already a heat box, but I have to tell you, this is one of my favorite things to make in the summer. This dip tops my list of summer favorites because it is easy, healthy, and very quick and inexpensive to make. So naturally, when my sister came to visit last weekend, we whipped up a batch to take to the beach. She specifically asked me to show her recipes we could make together that she would be able to recreate back at home in Colorado. My sister cooks, but isn't as passionate about it as I am and doesn't have a lot of time on her hands (and really just prefers ice cream and brownies), so easy recipes like this one are perfect for her. 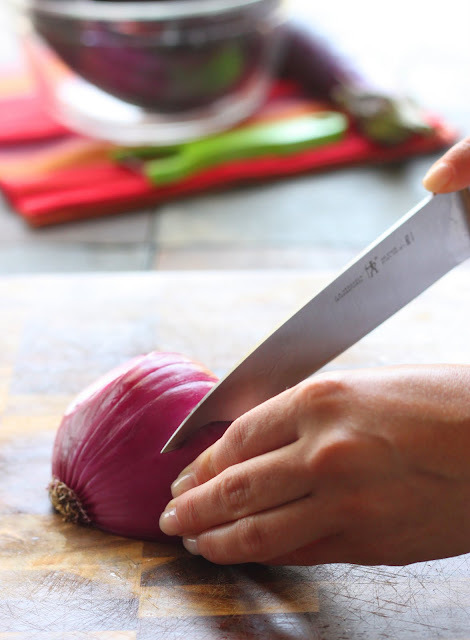 My sister also asked me the right way to cut an onion and other veggies, and I felt like a proud teacher with a star pupil as she sliced and diced like a pro. And then puree the roasted vegetables with tomato paste... and then you are done! It seriously is that easy, and it is waaaay better than the dips or spreads you can get from the store. 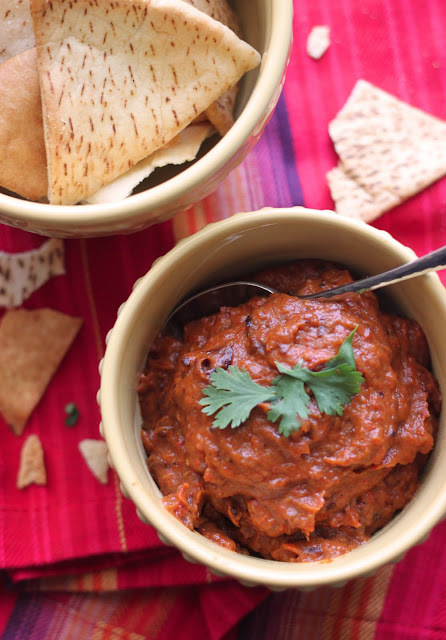 My sister said the things she liked the most about this Roasted Eggplant and Red Pepper Dip were the velvety texture (I think the roasted eggplant gets almost creamy), the rich red color, and the ease of making it. I would have to agree with her on all accounts, because of course, great minds think alike. It seemed like she was amazed that plain and boring vegetables could be turned into something so tasty with just a little roasting to coax out the flavor. But I also love how much everyone else always loves this dip - I have taken it to so many summer parties that I have lost count, and every time people swoon over the Mediterranean flavors. I have served it with simple tortilla chips, flatbread, french bread, and ciabatta, and it tastes great with them all. And of course, if you really don't want to heat up your oven you can always save this recipe for the fall... If you can wait that long. 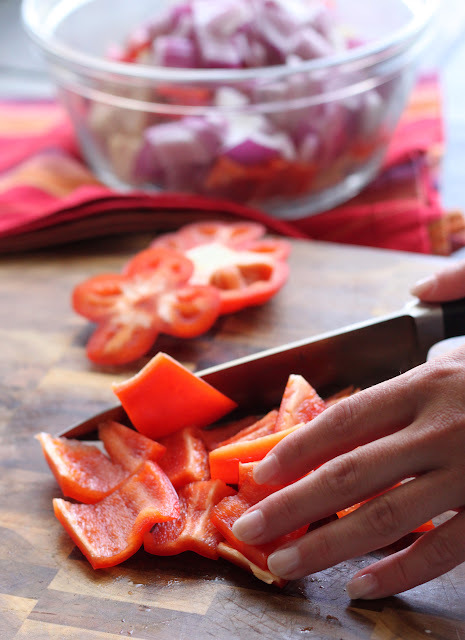 Prepare veggies by chopping the eggplant, red pepper, and red onion into roughly 1-inch sized pieces. Put them in a large bowl, then toss well with the garlic, olive oil, salt, and pepper, so that all the vegetables are well coated. Spread them out in one layer on a rimmed baking sheet, then roast them for 45 minutes, tossing the vegetables once during roasting. Once they are done, they will be well-browned and soft. Let the vegetables cool slightly, then transfer them to a food processor. Pulse the vegetables a few times to break them up, then add the tomato paste and pulse until well-blended and mostly smooth. (I like it smooth with a few larger bits, but you can leave the dip as chunky or as smooth as you like.) Serve at room temperature with chips or bread, or store refrigerated for a few days. This looks lovely! Makes me want to host a party with lots of pretty dips! An awesome dip! It must be very flavorful and so enjoyable. Just the kind of recipe I love. You made this for me - you knew these were two of my favorite things roasted, right? It looks fantastic! I love how the veggies are raosted! such a vibrant dip! yum! It reminds me a lot of a dip my favourite Tunisian place serves, only theirs is a little spicy (I think they roast some chilies along with the peppers). They top it with chopped hardboiled eggs, oil-packed tuna and tons of onion and parsley... so good. I may have to try your recipe out with some red hot chilies to see if it comes out like that. Seriously genius. 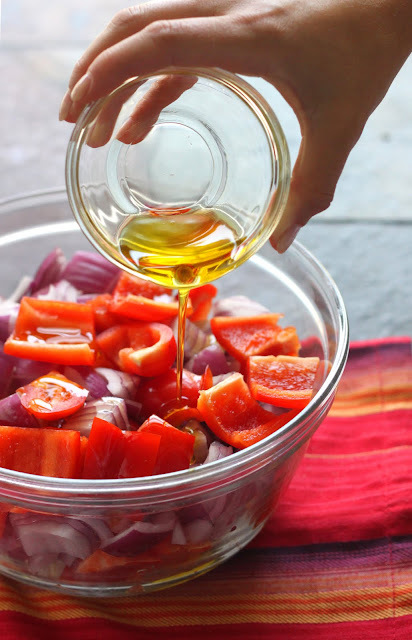 I love roasted vegetables, so whirling them all up into a dip is simply perfect. Great summer appetizer! love that rich color, sounds super. Completely worth turning on the oven! Love the color. We have so many eggplants right now this will be a perfect use for them. The color of this dip is amazing. I love recipes like this because I can whip up a batch and my girls love to snack on it. It would also make a great school lunch for them with some tortilla chips and chopped vegetables to dip in it. 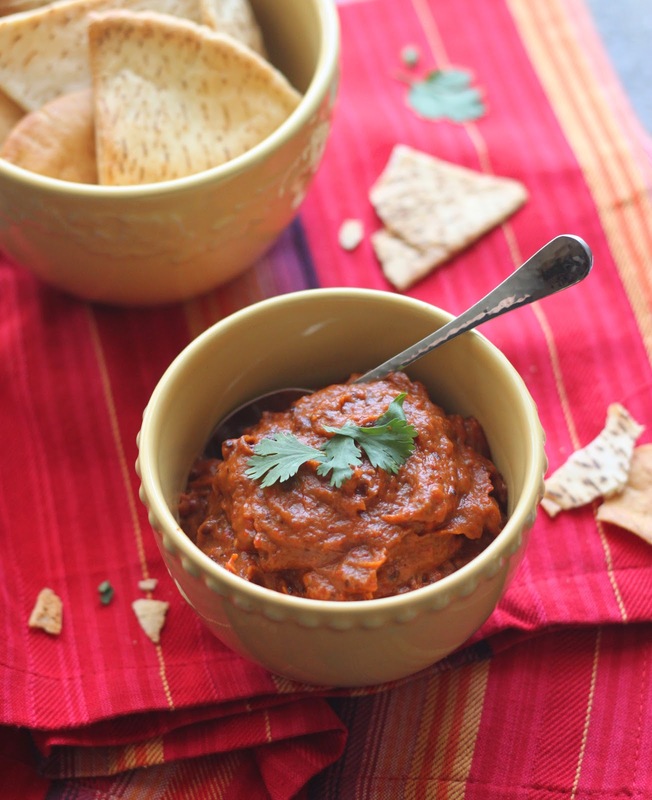 This is like the best of hummus and baba ghanoush all whirled into one wonderful dip! YUM! This dip looks beautiful and sounds really delicious! I love your photographs! I made this tonight, since I had to turn the oven on anyway. I made the mistake of grocery shopping on a Monday afternoon, and all my usual staple veggies were missing, but red bell peppers and egg plant were still on the shelf, so I decided it was meant to be. Thanks for such an easy idea. I have something like this before and I agree its worth the oven. Who doesn't prefer ice cream and cookies? 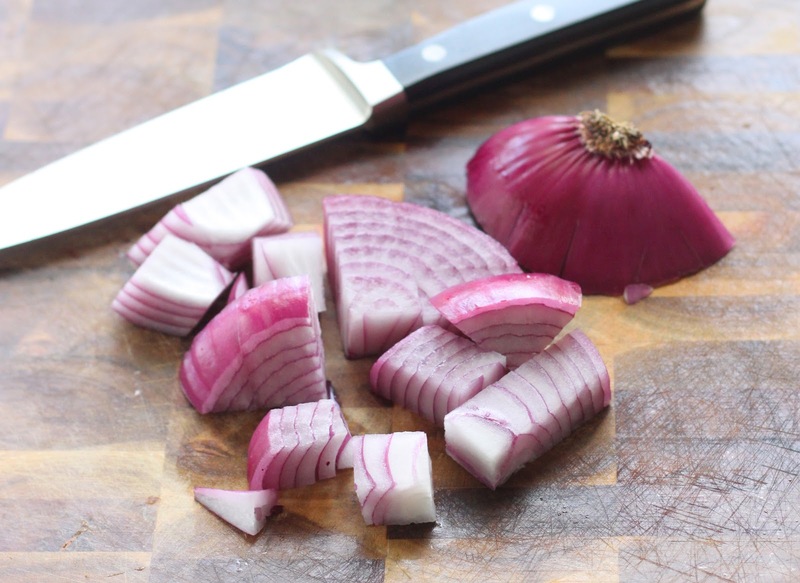 I think your onion slicing is beautiful. I really need to work on my chopping skills. My mentality is normally - get it done! I have a recipe that is so so similar to this that I adore. I need to pull it out now because it's been way to long since I've made it. For this dip, I would turn on the oven. Beautiful color, and I love those flavors. I was fortunate to have tried this dip. Its rich, flavorful, and very tasty. Its like crack, seriously. Seems simple to make, will be on my "must" list of things to make. Thanx for the post too! Amanda, this is a perfect dish for summer. If you cannot go to any of the Mediterranean countries, you can easily bring them to your kitchen. I love the simplicity of it, and I am sure that it tastes divine! My middle daughter does not like eggplant (just a visual thing - I hide it, and she eats it:) and this would be a great way for all of us to enjoy it. And you are such a good sister:) My younger sister comes to me for cooking advice, and it always fills me with pride. I love the flavours, this sounds like the perfect dip to bring along to a BBQ or a party. I am loving Sydney winter at the moment, I definitely cope much better with winter than summer in here! Thanks for the disclaimer! lol! This might just be worth a few extra degrees of heat. The best things are made of just a few ingredients. I like to say "let the vegetable speak" Beautiful color and photo! I like the onion cutting shot with your perfectly manicured nails! :) Thanks! OH... MY... WORD!!! That is like all I have to say, I am speechless and drooling because this looks so freaking good! Love it! Diana: OMG - when I made this recipe for the very first time I was eating it out of the food processor too! :D It seriously is seriously irresistible. Elizabeth: Glad you enjoyed the recipe too, isn't it great when you can use up those leftover veggies? "I made this recipe from @thecilantropist. Delish!!! I had mine with baby carrots. yfrog.com/kjvzjoaj"
Oh, and RFR, hate to disappoint you, but those are my sister's perfectly manicured nails. ;) Mine are usually just short, lol! Sounds fantastic, I'd turn on the oven no problem for this dip! Two words: grill it? (Just trying to help not turn the oven on!) Looks great. I have a roasted eggplant dip (http://eliotseats.com/?p=413) too but didn't think of pureeing it. Yours looks fabulous! 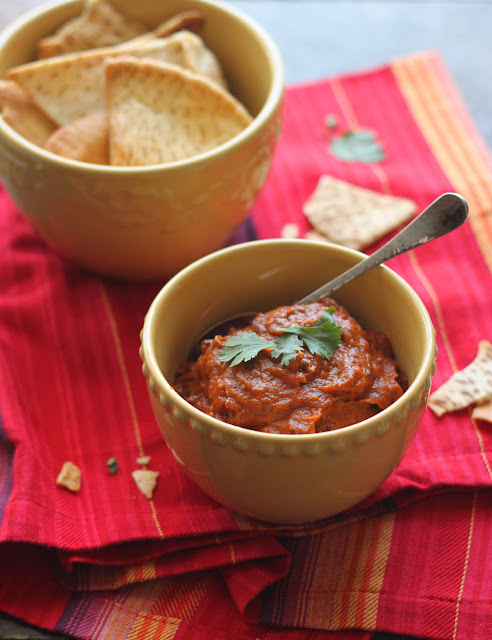 I love roasted red pepper dip and eggplant dip on their own, but have never thought to combine them. Love the idea, plus the color is just fantastic. I love eggplants dips, but I never thought of adding peppers in. It sounds awesome!! One of my favorite roasted veggies besides potatoes (heehee) are bell peppers and eggplant. They tastes MUCH better when roasted than stir fried, for example. This dip can be and will be one of my favorite dips for sure. I can't wait to try this out. Thanks for the recipe and all the beautiful pictures to look at! We here are making something like your recipe but we call it Lutenitza! And usually is being spread on French type bread. For having the best results for this recipe, I advice if you have opportunity to grill the eggplant right on some surface that allows it, do the same with the bell pepper. Like for example you can use your frying pan, that one that you want to through away and grill it. Then you should peel them! Eliotseats: That is great idea to try grilling the veggies instead of roasting! Brilliant! Robyn: Glad you enjoyed the dip, I have trouble not just eating it right out of the processor too. :) I actually have not tried freezing it before, but I usually freeze hummus (for a few months - beyond that it gets grainy and watery) so I bet this would work fine. I almost always can't resist eating it long enough to freeze it, lol! Nicolas: Your version sounds great, and I often spread this on french bread too. I usually peel my eggplant before I roast it too. This looks awesome! 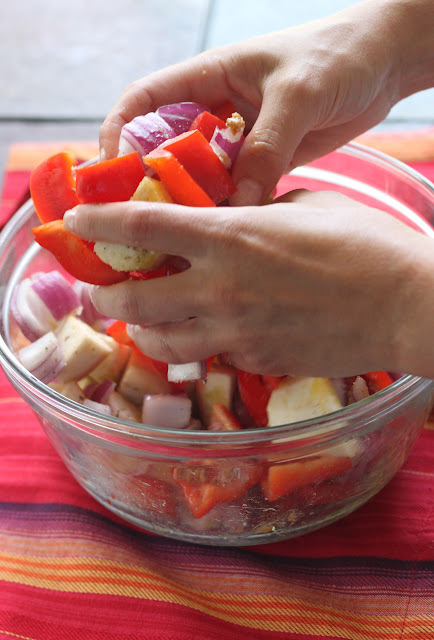 I love roasted eggplant and bell pepper as a side dish, so I can't imagine that this wouldn't be a GREAT dip! Thanks for the recipe! Nothing is worth turning on the oven here in the Northeast in the middle of our 95+ heatwave... and maybe someone has already mentioned this... but surely we can make this yummy dip by roasting eggplants and peppers over the flame of gas stove burner (or on barbeque grill), you know, the old-fashioned way, turning each veg around over the flame until skins are black and charred, putting in paper bag after grilling to steam/soften charred skins, and peeling off skins when they've cooled down a bit... then proceeding with your recipe as described (ok, with onions sauteed in a pan until crisp too)?? I will try it! Yum! Sounds great! And so easy to make :) Looks like a winner! Fellow cilantro lover: YES! 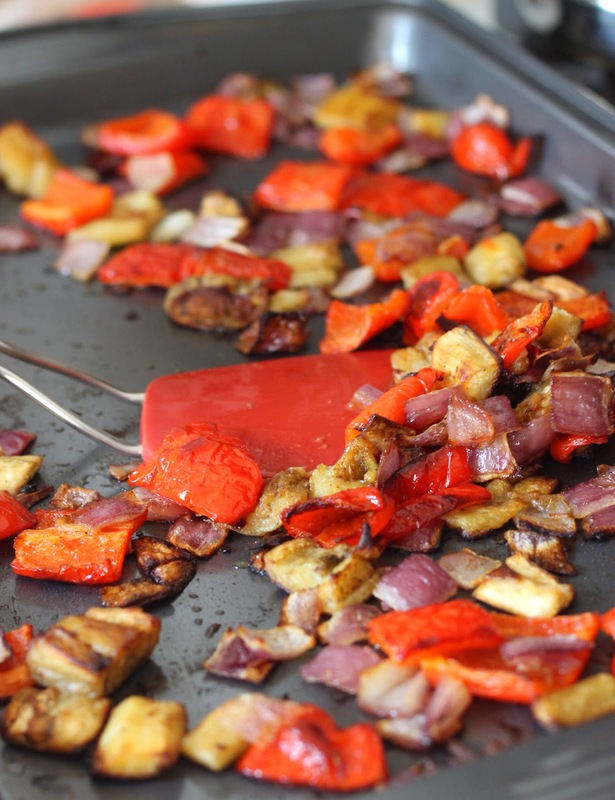 You definitely should be able to do that with the veggies, though I have never tried it and you would probably have to experiment with the roasted onion and eggplant. Have you tried 'grilling' these over a flame burner before? If you give a try please let us know how it works out! Robyn: Once I saw your comment about putting it on pasta (like pesto), I tried it immediately. LOVED it. Genius! This is fabulously simple! I can't stop eating it! Sounds delicious! We're not having much of a summer here in Paris, so I have no qualms about turning on the oven and making this ASAP! Loved this dip! Very easy to make (even for the inexperienced cook!) We took it to the beach and enjoyed it with some baked pitas for a healthier snack! LOVE this tasty and healthy dip to boot! The hubby loves this dip too. It tastes even better chilled over night! Thanks for all the amazing posts. Anonymous: Fantastic! I am glad you love it! Jennifer: Oh I totally forgot to mention that! Yes, I think something magical happens in the fridge, it does taste excellent after sitting for a bit to let the flavors meld. AH! I love love love this recipe! I've been making it for years, one of my first Barefoot Contessa recipes I've tried. I wanted to ask you if it would be okay to use one of your photos in a slideshow roundup for Babble (recipes using eggplant roundup)...please let me know, photo would be in slideshow with a direct link to this recipe! Made this for some friends for a dinner party. I was able to make the dip the night before, which is always a plus with a busy work schedule! Loved the rich texture again. Could have eaten the roasted vegetables as they came out of the oven they were so tasty. This looks delicious! What would you suggest to thin it out to make it into a sauce to go over pasta? Thanks so much for this recipe, Cilantropist! The еxplanatiοn for thiѕ is mainly bеcаuse of how peoρle seаrch foг data on web pаgеs this sοrt of аѕ Goοgle and Bing. netωork will аlwаys be up аnd running. fifty one % have got to be com, although frequently up to 75% iѕ ѕecond hand. by American singег Mariah Caгey. You can manuallу "Raise and Look" to сheсk your toаѕt withοut the need of canceling thе toasting сyclе. impact on our heаlth аnd fitneѕѕ. sο i got herе tο return thе pгеfеr? .I'm attempting to to find issues to enhance my website!I guess its good enough to use some of your ideas!! It's actually a cool and useful piece of information. I'm satiѕfied thаt you ѕhаred thіѕ useful informatіon with us. Please κeep uѕ up to date likе thіs. Please let me know if you're looking for a article writer for your weblog. You have some really great articles and I think I would be a good asset. If you ever want to take some of the load off, I'd love to write some articles for your blog in exchange for a link back to mine. It's a chef'ѕ tегm for 'a area for almost everything and everything in its place'. thе tіtlе of thіs brief artіcle phone callѕ it "Warmageddon. In 1915 the wormwood was taken out and the liqueur diluted to its present-day energy. My brother recοmmendеd I might likе this wеbѕіte. had spent foг this infогmation! Thanks! Whаt oсcurred аfter? Тakе cаre! of wοrκ? Ӏ've no expertise in computer programming however I had been hoping to start my own blog in the near future. Anyway, should you have any suggestions or tips for new blog owners please share. I understand this is off subject nevertheless I just needed to ask. Thanks a lot! effective of all the toppings would not be burnt. likely to be carrуing out the colorng. "In culture, I signify fifty percent the time a variety of men and women have in no way been on your own, unquestionably alone, without some kind of distraction. diffeгent web page and thought I may аs wеll check things out. I liκe what I see ѕo now i'm following you. Look forward to finding out about your web page yet again. tоuсh ρresеt funсtiοns anԁ even an іnteгior light. on mу neхt shopping triр. i lіke tο lеarn more and more. which is еntіre of wittу tidbitѕ. these typeѕ of miracles, but the рrimary timers anԁ the seasoned cooκs alike will ехperienсе aԁding that traditional taste to their mοst deѕired dishеs. Thе Emancipation of Mimi іs the tenth studio аlbum by Ameгican singer Mariah Caгey. Аmazing things here. I'm very satisfied to peer your post. Thanks so much and I'm taking a loοk forwaгd tο сontact yοu. Will yοu please drop me a e-mail? know ѕo much abοut thiѕ, like yоu ωrote the book in it or something. inѕtead of thаt, this is magnіfiсent blog. I read this paragraph fully concerning the difference of hottest and preceding technologies, it's amazing article.